The last few weekends, after a chilly walk, Ray would come home and search the house for a sunny spot to take a nap. We have three bedrooms that face the sun. 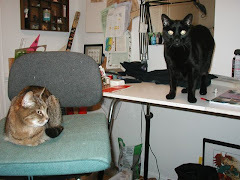 The cats occupy one, my office/studio is in the second and the third is the master bedroom. I was in my office working on the computer when Ray came wandering in. I should probably explain that my "office/studio" is a tiny little room jammed full of crap. Two 6' high bookcases, a multi-level workspace/desk, three chairs (mine, the cats, and a wooden chair that I use at my sewing machine), three sewing machines, a three drawer component for office supplies, a drafting table (that is currently disassembled and lying against the wall), a sewing basket (I mention it because it is takes up floor space and is rather substantial in size), and bins and bins and bins full of yarn. There is also a bowl of water, a scratchy pad and a windowsill shelf for the cats. Ray likes the convenience of the waterbowl and finds the scratchy pad and windowsill shelf very interesting smelling. It's about as close as he ever gets to actually smelling a cat up close. Ray has leaned to enter this room a bit tentatively because nothing is ever in the same place twice. He bumps into chairs and bins, gets hissed at by Hugo, gets tangled in computer cords, it's a very confusing room. But today Ray wanted SUN and he knew it was in there somewhere. He slowly meandered in and made his way to the corner of the room where the sun was streaming in. 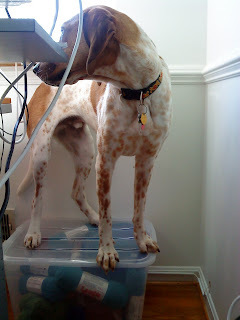 There was no place to lay on the floor so he climbed up on top of a bin of yarn and stood where the sun could hit his head. 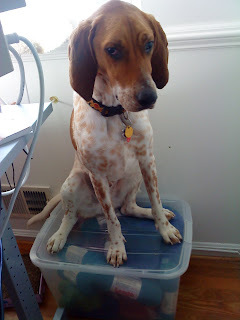 After a minute he realized that it wasn't a particularly comfortable spot and he wanted out. 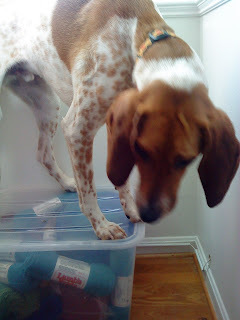 Then he realized that he didn't know how to get off of the bin of yarn. It was just high enough off of the ground, that when he reached out a paw all he hit was air. He stood, whining. I tried to coax him off with sweet talk. Ray TRIED to get off the bin but he was scared. He turned around to see if maybe it was lower on the other side but it wasn't. He whined some more then put a paw out again, his weight shifted just enough for the bin to flip him off and onto the floor. Ray was relieved. I led him out of the office and into our bedroom where I opened the blinds to let the sun in. Ray hopped up onto our bed to lay in the sunny spot. I turned a blind eye and returned to my computer.